We were blessed with a baby boy in the early hours of last Sunday. The Wife, The Daughter and I are as blissed out as can be about the new addition to the family. Our son! My son! I'm as happy as can be. May your 8 pounds 5 ounces lead you onwards and upwards. I plan to spend as much quality time with my family as I can. All the observations I've made in the past about the effect of parenthood on one's published output now apply doubly. In this instance however, I have a few pieces lined up that will be published automatically in the next few months as this blog will run on autopilot. There is much deliberation in the mores of Akyem-Swedru, Accra and Aburi about the naming of children and a certain logic that is often followed (lineage, day names, special names and so forth). Still I am minded of the weight of all of those additional names, those shadow names, that may not appear on one's birth certificate but that still apply to you. Even at my age, I am still learning about names bestowed on me. There is power in naming and I wonder what names others will emphasize for our son. I look forward to his outdooring and to marking all the ceremonies that are to come in his life. Welcome my son. I love you. I'll add the following playlist to augment my previous take on parenthood. The theme is joy. (Listen here). Elation is the prime sentiment. Almost as influential as Chic's Good Times. Off his First Born Second album. I haven't really used the Nii Amaah name that all first born males in our family inherit but I wear its mantle. Sunday born children in our tradition automatically get called Kwesi. My favourite interpretation of this ballad. I certainly hope that our son inherits my father's and my own love for the soothing tones of Ben Webster. 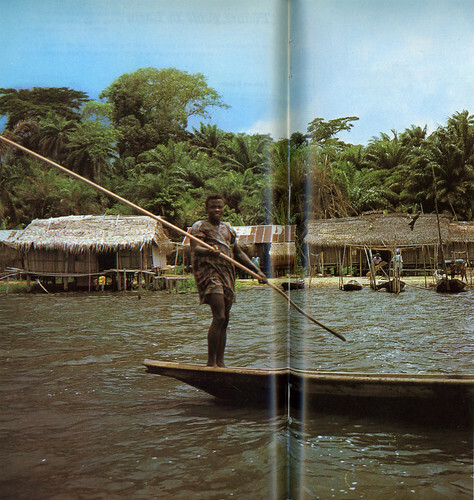 The city of Lagos, Nigeria, as seen through the lens of a 1975 guidebook. My customary routine when coming across such material is to wax poetic and at length but I'll strive for brevity this time since the nuances of Lagos and indeed Nigeria are mostly lost to someone who spent his childhood in Accra, Ghana. 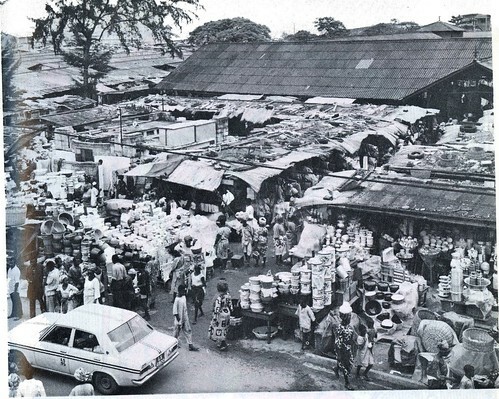 Many things do resonate since our colonial and post-colonial experiences are similar: the look of the buildings and people, the descriptions of the markets and shops etc. The obvious differences between Lagos and Accra lie in scale and intensity - perhaps this is true more broadly about the differences between Nigeria and Ghana. Accra to this day feels like a sleepy town in comparison to Lagos and of late, Nigerians, rich and poor alike, use Ghana as a rest and recreation area. The streets of Lagos are more crowded and the contrasts are sharper. The rich are richer, the poor are poorer, the hustle is fiercer, the pleasures and the dangers are more intense. In any case, I have a number of friends and family who live in and grew up in Lagos (and a surprising number who are writing about Lagos) who would no doubt find this useful. 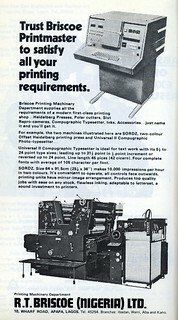 A guidebook provides a different kind of insight than a year's worth of Drum magazine focusing, by necessity on practical matters. This is a boon to armchair cultural anthropologists. 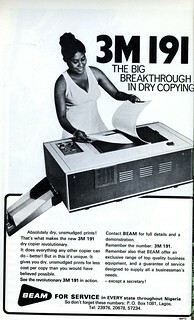 If you're writing a novel for example, your characters can throw in a tidbit about safe choices for a good musical night out: Fela at the Shrine, Ebenezer Obey at Miliki Spot, Sunny Ade at Banuso Inn, dwell on the prices and the kind of crowd and note the caveat that the music does not get going until after 10.00 p.m. A contrarian would suggest traditional theatre by way of Duro Ladipo, Ogunde or Alawada. Your characters can discuss the virtues of Ben Osawe's wood sculptures or whether to go find that old man on Ikoyi Island whose carvings are imbued with the spirit of Ogun, or indeed that young apprentice who operates in that shack behind Bobby Benson's hotel. It helps to know that the kind of prices charged for a taxi or bus ride even if the price cited in the book should be viewed as a ceiling being geared to visitors. A visitor's guide by necessity points out things of interest to tourists but locals too gain in learning the outsider's perspective. 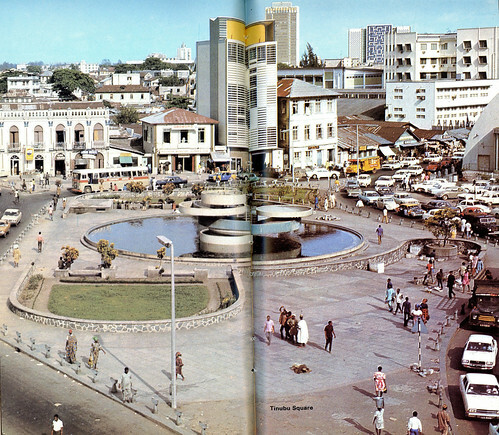 Lagos is the Federal Capital of Nigeria. It is also the Lagos State Capital and has a well established city government. It is the centre for all diplomatic missions and has a large and busy port. Diplomats, government officials, businessmen, workers, traders, travellers, all flock to Lagos, as well as many unemployed hopefuls hoping to make their fortunes. 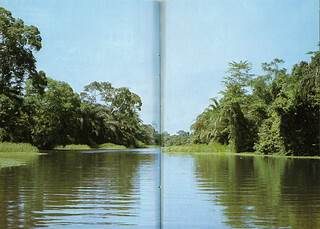 The population is estimated at 2 million and increases daily. The City is undergoing considerable reconstruction and development. The old and the new mingle together: large commercial complexes next to small trading stands; mini skirts and traditional robes. It is a city of sights, sounds and smells, some pleasant, some not so pleasant, but all giving evidence of the vibrance of the city. The best way to get to know Lagos is on foot, for it is on the street that everything is happening. Lagos is not an easy city for a tourist, but if you are willing to look the rewards are many. 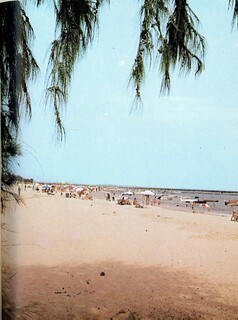 In 1975 the estimate of Lagos's population was 2 million. The 2006 census placed it at 7.9 million, and by 2011 the UN was estimating it at 11.2 million. Just the following year, the New York Times would cite estimates of 21 million. Regardless of what you think about such wild estimates, Lagos' population has either quadrupled or grown tenfold over a generation. Development of the city has been relentless and mostly unplanned - messy is the word perhaps. 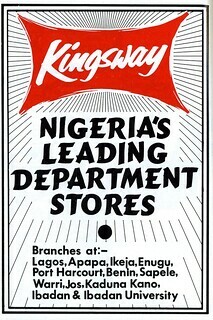 Lagos remains the commercial capital and heart of the country but the Federal capital is now Abuja. The military governments of the 1980s wanted their clean slate Brasília (the more recent parallel of the Lagos-Abuja relationship might be Burma's military building Naypyidaw to replace Rangoon). It is said that Abuja is indeed stepping into its political role these days but Lagos remains a force to behold. Lagos can be very chaotic. You must watch the traffic and be careful crossing streets. Sometimes things take a long time, so you must be patient. It often helps if you are polite but persistent. It is hot but it is important for you to stay cool. If you find yourself in a difficult situation ask someone for help and generally they will. Remember to dash (tip) all the people who offer you small services. They will remember too and be helpful the next time. Nigerians like to laugh and laughter is often the key to solving many problems. A large amount of research was done for the book and there is a quite sensible and extensive section on the city's history. 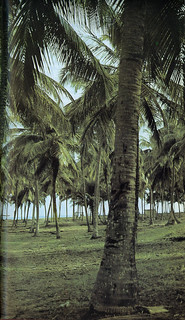 The most interesting parts of the book are the many suggested tours and day trips (Modern Lagos and Museum, Isale Eko (Old Lagos), Cloth Market Balogun Street, Gutter ("Gotta") Cloth Market, Tinubu to Jankara, Ikoyi Island, Victoria Island, University Of Lagos, National Theatre and National Stadium, Tarkwa and Lighthouse beaches, Badagry, Epe And Yemoji River). 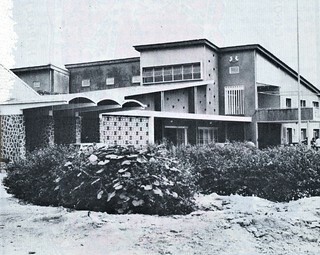 There is particular sensitivity in the architectural tour to the Sierra Leonean and Brazilian influences on the city's architecture. 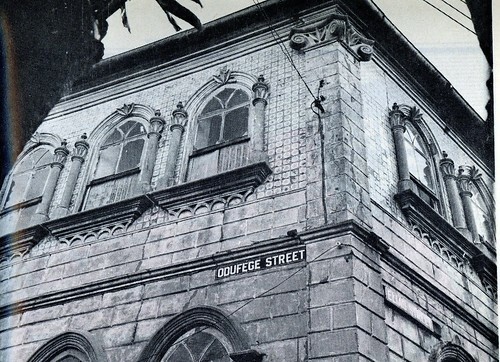 I wonder what gems a present-day architectural tour of Lagos would reveal for the city is in constant flux, always looking forward. One wonders if any of the landmarks pointed out here are still standing. If you watch people in Lagos it looks as if everyone is buying or selling something all the time. 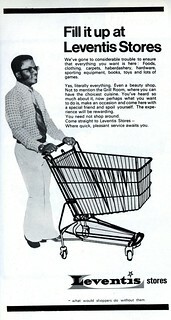 The shops carry almost everything but the prices are high. 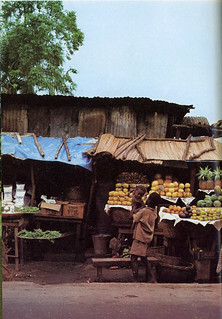 The markets also have anything you might need, a bit harder to find, but at better prices if you are good at bargaining. It is best to go to Jankara market with somebody who speaks Yoruba. 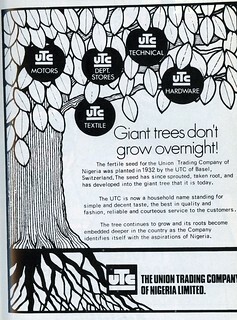 The other giants, Leventis and UTC, also feature. 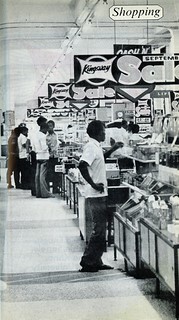 These stores (and now malls) compete against the traditional markets. 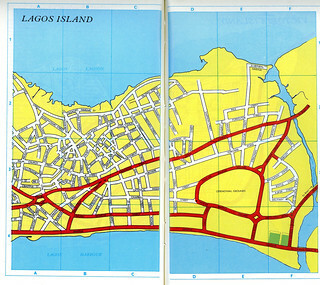 The various maps may not be (Apapa, Ikoyi Island, Lagos Island, Victoria Island) as detailed as today's Google maps but they are highlight much of what was notable at the time. The airlines, PanAm, Ethiopian, Lufthansa, UTA and British Caledonian. 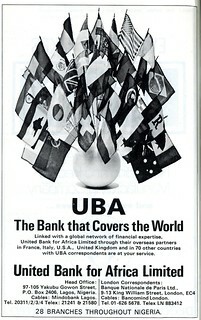 The banks, Barclays as ever has a big presence, UBA too and also the insurance companies. 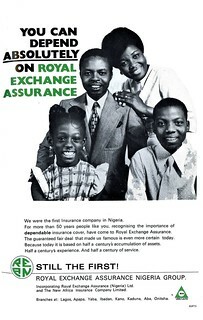 Forty years later we are still under-insured and underbanked, the informal sector is still the lifeblood of African economies. 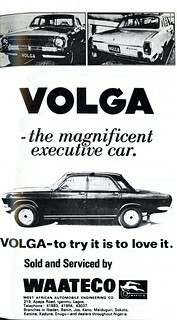 The car companies feature too with dubious Volga executive car alongside Datsuns who were beginning to make a splash. Most Nigerian meals consist of pepper soup made with fish, meat, or chicken, accompanied by a large portion of rice, gari or yam. At parties usually a wide variety of dishes are offered... Almost everything is well spiced with red pepper and you must ask if you would like a bit less. It even dwells on the various traditional ceremonies one might witness. When you drive around in Lagos any evening but especially on weekends, you may find gaily dressed people in small or large crowds, feasting, drinking, singing, drumming and dancing. They may be celebrating the birth of a child (usually the naming ceremony or baptism is on the eighth day), or a wedding, or the death of an old person or the anniversary of his burial. If an old person dies this is not a cause for mourning in Yoruba tradition. Rather it is a reason for joy and thanksgiving because the deceased has had a long and fulfilled life, has had children, and has now, at the right time, returned to god and the ancestors. One can steal glimpses of Oba's palace and other landmarks. The discussion of religion is astute and practical and a testimony about what would prove to be the real growth industry in the ensuing years. Apart from the major Christian denominations a number of new sects and movements have sprung up in Nigeria and particularly in Lagos, like the "Cherubim and Seraphim", and the "Aladuras". Apart from some theoretical differences their practices are probably nearer to the traditional African rituals with ecstatic happenings, lively songs in local languages, clapping hands and the use of drums and bells. They have many small churches throughout Lagos. There are also a growing number of churches belonging to the Pentecostal movement. Sections on elementary Yoruba and masquerades and traditional festivals round out the coverage. Sadly, one doesn't have a time machine to go back to Lagos 1975 but with this book in hand one enters a lost world, vaguely familiar at once, yet alien at times. 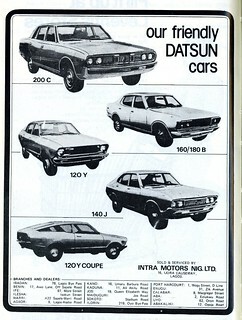 What have we lost and what have we gained in the intervening years, one wonders? 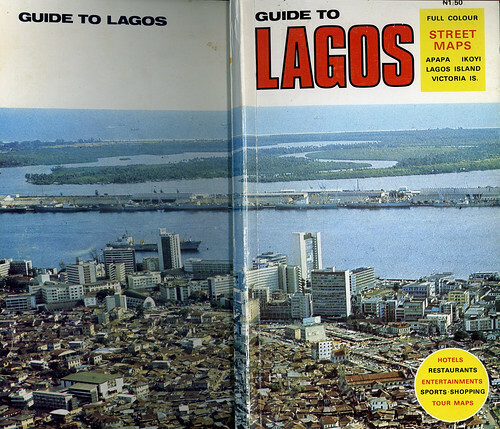 Now that Lagos is being rebranded in this new millennium I'd love to compare a present day guide to what I've read here. Many thanks to the Pulleyblanks, young and old, for writing and sharing their insight on Lagos. I leave it to others to do a close reading. The soundtrack of the place to be. Psychedelic disco funk. Brash and loud like the city itself. 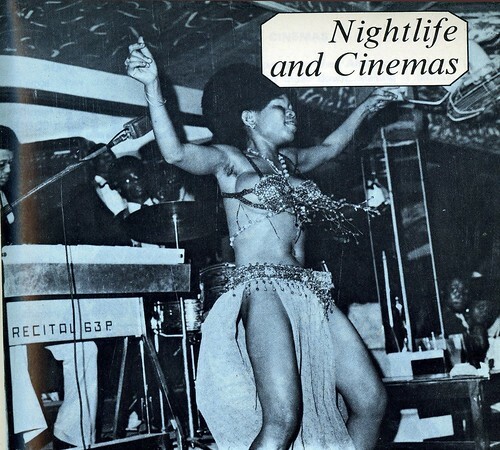 This fabulous compilation features a who's who of 70s Afrobeat, highlife and juju including Sir Victor Uwaifo, Cardinal Rex Jim Lawson and Chief Commander Ebenezer Obey this time with his Inter-Reformers Band.